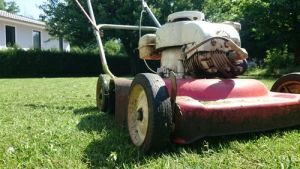 When you’re out mowing the yard in the scorching sun, you probably don’t stop to think about what your mower is costing you to run. It is relatively easy to know how much you’re spending on fuel for a petrol mower, but what about electric mowers? In this article, Canstar Blue explores how much power your electric mower uses and what it costs to run. We also compare these costs to petrol mowers to see which type of mower is cheaper to operate. If you’re after more general information on electric mowers verse petrol mowers, then be sure to check out our mower comparison guide. How much power does an electric lawn mower use? The amount of power that your electric mower uses will vary considerably between different models. Most electric lawn mowers have a cord, providing endless run time at the expense of maneuverability. Some other electric mowers instead use a rechargeable battery, which is particularly convenient, but not ideal for larger lawns. If you have a corded electric mower, then it will typically use between 700 and 1800 watts of electricity per hour. Cordless electric mowers, on the other hand, tend to be a bit weaker. Battery sizes are often between 40 and 90 volts, requiring 600 to 1400 watts of electricity to charge, depending on battery amps. How much does it cost to use your electric lawn mower? An electric mower typically costs between 20 cents and 60 cents per hour to run, depending on the wattage of the mower and how much you pay for electricity. Wattage (W) refers to how much energy the mower will consume in an hour. For example, a 1000W mower will use 1000W per hour. You can usually find the wattage in your mower’s instruction manual or in the product details section of a seller’s website. Electricity usage rates are provided in terms of kilowatt-hours (kWh), which is equivalent to 1000 watts. Obviously, the more you pay for electricity, the more you will pay to use your electric mower. 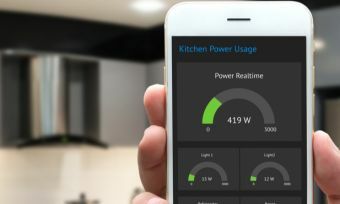 Electricity rates can typically be anything from 20 cents to 50 cents, depending on your location, retailer and tariff. For the calculations below, we assume an electricity usage rate of 33c/kWh. Depending on how fast you can mow… the above running costs suggest it will cost in the vicinity of 17c to 39c to mow a quarter-acre block (assuming it takes approximately 40 minutes), or slightly less if your electric mower is cordless. Of course, it will cost you more to mow your back yard if you’re paying too much for electricity, so be sure to check Canstar Blue’s electricity comparison tool to see if you’re getting a fair price for power. Is an electric mower cheaper than petrol? Yes, electric mowers are cheaper to run than petrol mowers, however petrol mowers easily have more power and are better suited to larger and more difficult yards. A typical petrol mower has a fuel tank capacity of around 1 litre, which will cost about $1.40 depending on the fuel price at the time. A full fuel tank should cover around 1,000 square meters of your yard – or around a quarter-acre. While the exact running cost will also depend on the size of your mower’s motor, you can see that petrol mowers can cost three or four times more than an electric mower. Depending on the weather where you live, you might find yourself mowing the yard once every 2-3 weeks. 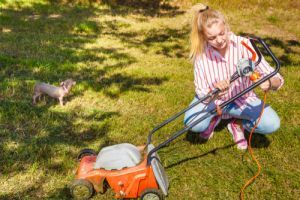 The calculations below use the running cost estimates from before to calculate what you can expect to pay using an electric and petrol powered mower. The calculation is based on mowing a quarter-acre block that takes 40 minutes, 21 times throughout the year. Keep in mind that these calculations are broad and are likely not correct for your specific mower. Once again, exact running costs will vary on your mower, engine size, fuel prices, electricity prices, and other variables. Mower prices vary considerably depending on the model, but electric mowers tend to have a lower entry price. Petrol mowers usually cost anywhere from $350 to $800, while cordless electric mowers cost between $250 and $800. Electric mowers with cords are usually much cheaper, costing around $100 to $250. Having established that electric mowers are both cheaper to run and buy, does that mean you should ditch traditional petrol mowers? Well not so fast. Electric mowers are perfect for small suburban yards, with grass that’s relatively easy to cut. However, petrol mowers excel in terms of raw power and are not encumbered by the need for cords or recharging batteries. Whatever you choose, if you’re in the market for a new mower, then be sure to check out Canstar Blue’s lawn mower satisfaction ratings to see which brands Aussies trust to get the job done.